kohoBeat is an international group of musicians based in Finland. 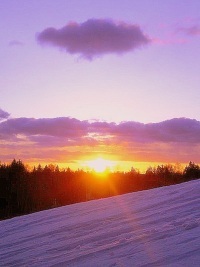 We promote our own music and musicians by organizing classical and contemporary music concerts in Finland and abroad. Our productions are done in cooperation with cultural entities, and made possible thanks to the support of our sponsors. kohoBeat’s fifth project took place in Lima and Quito between May 31st and June 9th, 2011. This project consisted of a series of events including: a flute-piano recital by Sami Junnonen (flute) and Javier Arrebola (piano), which was presented at the Peruvian American Cultural Institute of Miraflores, Lima as well as at Teatro Casa de la Música in Quito; a series of conferences on three different topics in collaboration with the National Conservatory of Music of Peru: Finnish composers by Jimmy López, Finnish vocal music by Javier Arrebola and the Finnish school of conducting by David Claudio; master classes on flute and piano and, finally, two Symphony Orchestra concerts in collaboration with the National Symphony of Peru and the Philharmonic Orchestra of Ecuador. This event was possible thanks to the generous support of our sponsors: Swedish Cultural Foundation in Finland, Sandvik del Perú, Corporación ABL, Instituto Cultural Peruano Norteamericano, Filarmonika, kohoBeat. We are deeply grateful to everyone who made this project a complete success and we will continue our commitment to excellence. Please visit us on Facebook too see pictures of this and all our previous events and for updates on future projects. Thank you! A warm welcome to our new Honorary Members! Gustav Djupsjöbacka, Rector of the Sibelius Academy in Helsinki, Finland. Miguel Harth-Bedoya, Principal Conductor of the Fort Worth Symphony Orchestra and creator of the Caminos del Inka project. Pekka Orpana, Ambassador of Finland in Peru. "Saaga", a unique program entirely devoted to the music of Finland and South America, particularly the Andean Region, showcased kohoBeat's David Claudio, Javier Arrebola and Jimmy López in cooperation with the City Orchestra of Joensuu. 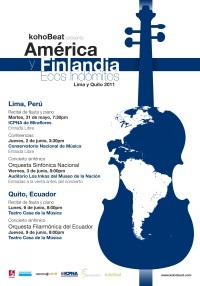 With this project, kohoBeat continued its mission to reinforce the musical ties between both lands, which we have been doing during our most recent projects including Finlandia: Canto a la Música, presented in Lima and Santiago (2009 - 2010), and Caminos del Inka, which was presented in Helsinki (2010). Joensuu City Orchestra. Soloist: Javier Arrebola, piano. Conductor: David Claudio. Did you know that kohoBeat has also a Facebook profile? Follow us on Facebook, click on the image below.